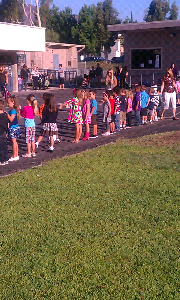 My son Konnor in the morning circle that the Kinder do every morning. This is where they do the Pledge of Allegiance, Classroom cheers and more. Then they march away to their classrooms and start their day of learning. I watch from behind the gates and my son always turns around to look for me as they march away..and gives me the biggest smile and wave.